Melissa's lending her sweet style to this week's Make It Monday video. Learn her secrets to creating multi-layered vellum die cuts so you can give your projects that special soft, vintage touch. –Create a project utilizing your take on the challenge. 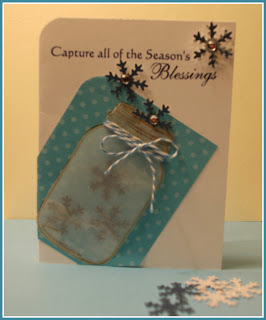 Your project must use at least one Papertrey product and layered vellum die cuts. –You will have until 7am, Monday, November 26th, to add your link to the list to be eligible to win. And you can enter as many times as you like. –One randomly selected winner will be chosen from ALL the entries on Monday, November 26th, after 7am. The winner will be posted here on this blog post, on Twitter and Facebook. The randomly selected winner will get a $25 PTI gift certificate to spend however they like! Congratulations to Helen F. for being randomly selected as this weeks winner! Please email Customer Service and provide the email address you would like your $25 gift certificate sent to! And a big thank you to everyone else who participated in this challenge. There were so many amazing entries! Enjoy the rest of your week! Loved it, loved it!!!!!! Thank you so much Melissa for giving insight to your bow process. I will definitely be trying it out. And now of course I have to have that mitten die! Lovely project and great tips! Just like you …. your project is adorable!!! You always add such detail to your projects that make them so special. I enjoyed watching you create this mitten project and hearing all your thoughts about the details and extra layering. The mittens are gorgeous and adorable at the same time! I really love these! I’d love to see the detail in the video if at all possible can you raise the resolution to a minimum of 480p. Great project however. And I will be die cutting some vellum in the near future. I sincerely apologize. I’m working on fixing it for you. Thank you for your patience. This is so beautiful Melissa I loved the video- I thought it was my computer doing the two voices glad to hear it is not. I love the sweet colors you used what a great design.. Thanks for the inspiration. Beautiful project, Melissa! Thank you for sharing your process with us…I am always inspired by your creations! 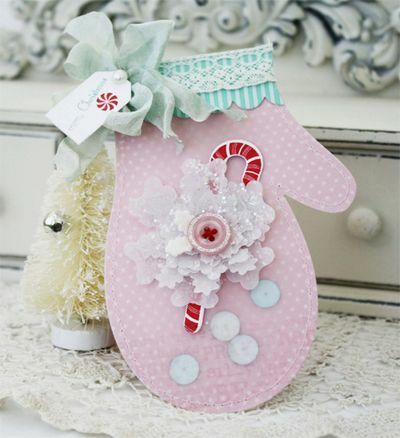 So sweet and gorgeous..LOVE it!Thank you so much for this tutorial Melis! Your projects are always so beautiful and make me want to “reach out and touch.” Love the colors, the layers, ribbon, felt , etc. Plus, I really enjoy your sweet voice! Melis, you are so talented! Loved the tutorial. Thanks for sharing some of your tips & techniques!! This is so beautiful! I can’t wait to make some of my own. Thanks so much for sharing this video. WOW… This is so beautiful!!!! Melissa I was SO excited to see that you were teaching the Make it Monday video, I couldn’t wait to watch it and I loved it!!! I love all your tips and techniques that you teach us!!! Your work is amazing and so are you!!! Thanks for sharing your wonderful talent!!! Melissa, loved your tutorial and that mitten is just soooo gorgeous!! I’m so glad I decided to order the mitten during this past release. Very cute mittens! Did you use the same adhesive on everything (vellum, ribbon, etc.)? If so, what is the brand. My video was also fuzzy and there was a lot of shadow which would probably be alleviated by camera placement. Very sweet Melissa. That tag is so you, your style. Thanks for sharing. I’m sorry you’re having a hard time viewing the details. I use Beacon Fabritac. Thank you, thank you for doing the video on your double bows – I’m someone who has been asking…thanks for sharing your talent – I always love what you do!